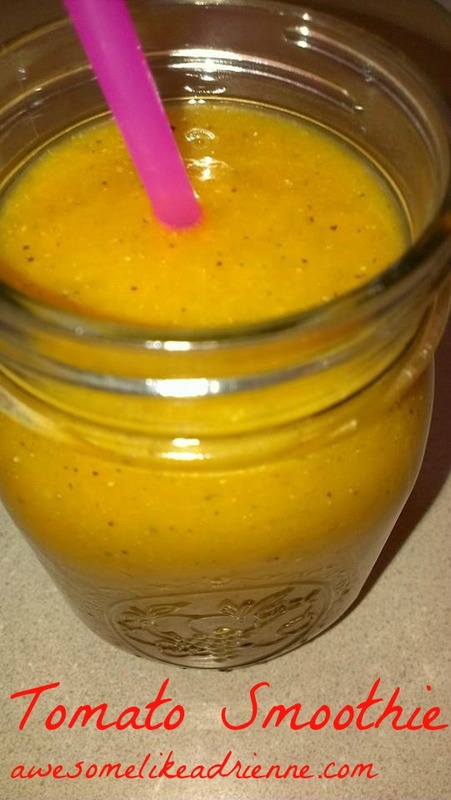 I removed the watery seeds from the tomatoes, gave them a rough chop and then added all of the ingredients into the blender and blended until smooth! This one was definitely energizing! You can also make it spicy if you want by adding pepper, etc. Today I did lots of food prep at home for the week including these seed/nut & dried fruit mixes. I was semi-obsessed with this certain gelato for the past few months and I kept all of the containers knowing I wanted to do something with them! 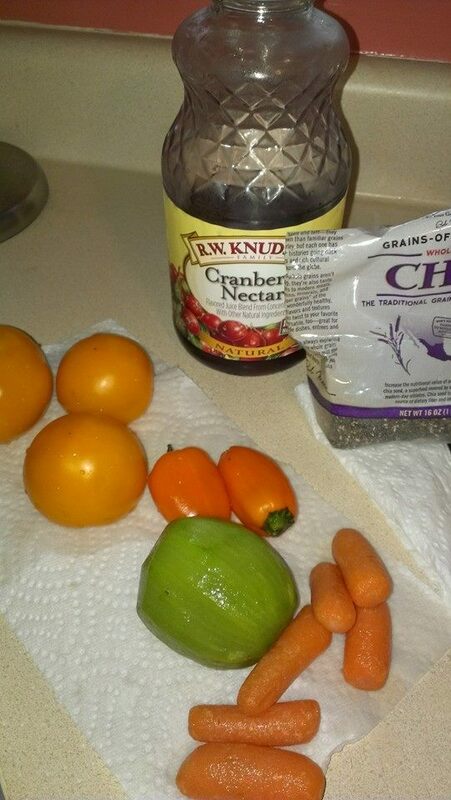 Last week I made chia seed pudding and used them for that to store individual servings in. I am trying to fill them with anything but the gelato! This week I wanted to make sure I had snacks for on the go or something healthy to grab at home. So I bought a bag of cashews, a bag of almonds and a bag of dried apricots. I had at home already a bag of peanuts, sunflower seeds and dates. I made 3 containers today. When I run out I will make a new batch with different ingredients and I love that it is a great use of my gelato containers! I may even give a container to each one of my clients this week just as an unexpected thank you! 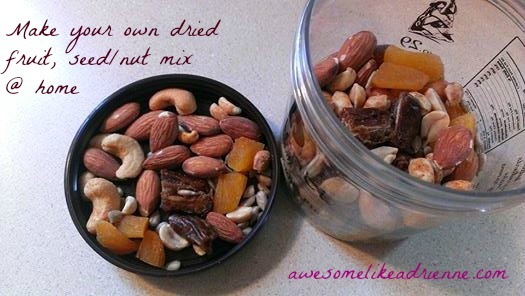 I hope you do this at home and grab a lid full as a healthy snack!! The lid is the perfect serving size-about 1/4 cup! Mmmmm, pastistio! 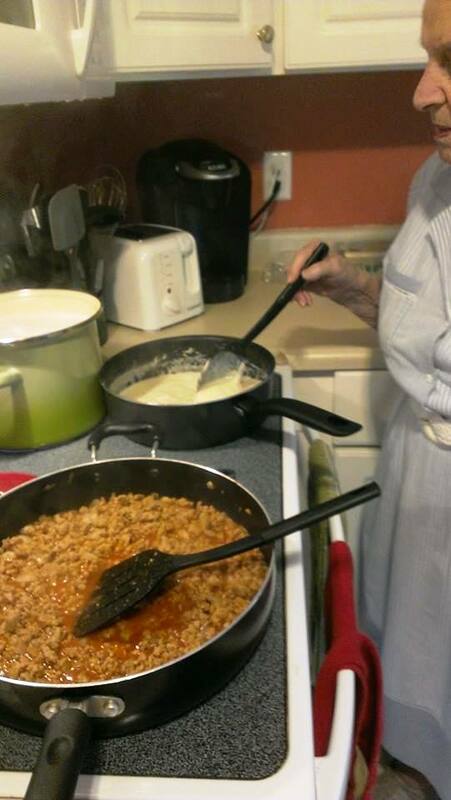 One of my YiaYia’s most fantastic Greek dishes she makes! I grew up with it, I ate it often and I love it! 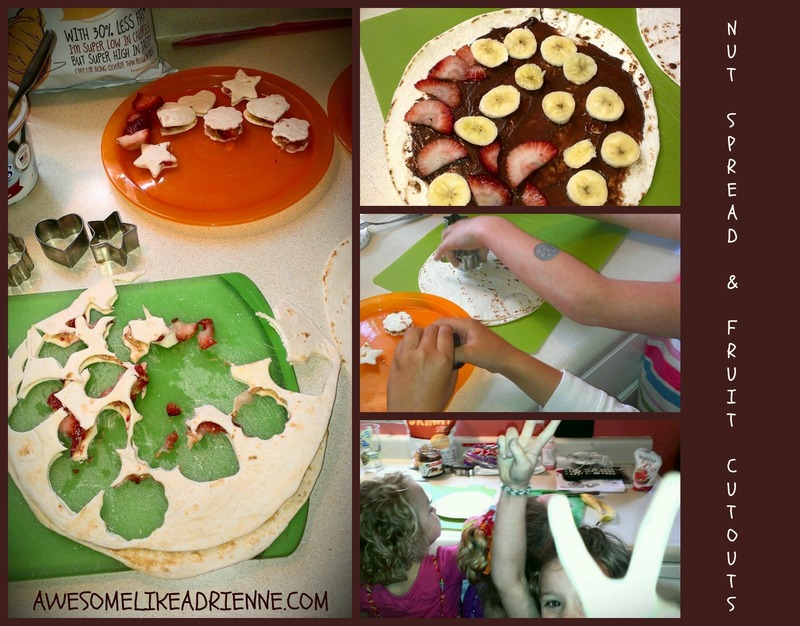 I have never tried to make it myself until this Father’s day weekend but of course I wanted to put my own healthier twist on it! People gave me slack for it and said why even bother? Afterall, it is supposed to be indulgent and rich! Traditionally, it calls for ground beef and white flour noodles. I used quinoa/brown rice noodles and ground turkey meat instead. That is her and I cooking it together yesterday in the picture so yes she approved of the changes BUT nothing compares to the real thing-this I am aware!! 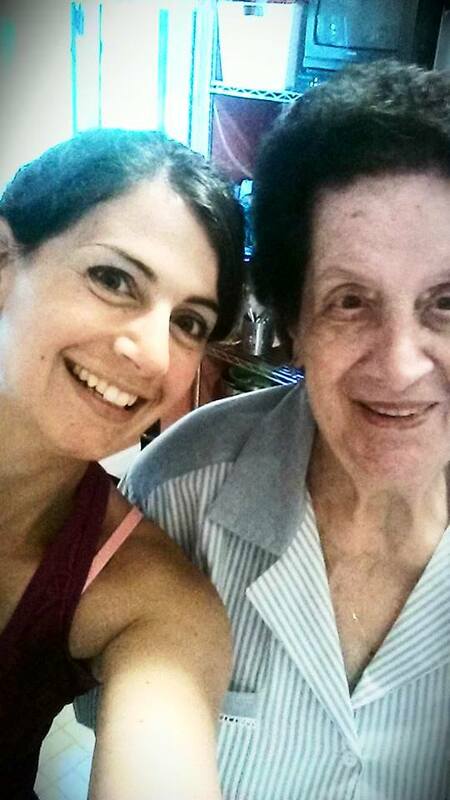 My YiaYia is 92 years old! Can you believe it??!! Here goes the recipe! Everything is hers except the meat and noodles that I used! Step 1: Cook your meat! Add 2.5 lbs of ground turkey or ground beef in a large skillet with 1 med to large chopped onion, 2 tsp minced garlic or 3 cloves, generously season with salt, pepper, garlic powder and oregano. Let it cook through about 20 min-stirring often to break the meat apart into little crumbles. Step 2: Add 1 small can of tomato paste and 2 cups of water to the meat mixture and continue to cook until most of the liquid is absorbed. Leave on med heat and let it simmer while you cook the pasta and make the cream sauce. At this point if you have fresh parsley add a handful and also a pinch or so if cinnamon and red pepper flakes to add some spice but not too much. Step 3: Cook 1.5 lbs of pasta according to directions-I used quinoa/brown rice spiral noodles from Trader Joe’s. Step 5: Cream sauce (Bechamel sauce)-this is where all the delicious trouble starts! Take 1/4 cup or so of oil-I used a mixture of coconut oil, canola oil and evoo for this and place it in a med heat larger skillet. Add 1/4 c butter to skillet. Add flour (I used Millet flour) by the spoonful to the oil/butter stirring to make a thicker rue-you will add about 1 cup by the time it is thick enough. Add milk about 2 cups slowly while stirring and still trying to form the sauce. If at any point the sauce is not thickening add a touch more flour. Add 1 small can evaporated milk and stir, stir and stir some more until mixture is thick and melted all together. Then turn off heat and put half of the sauce into a separate bowl-place aside. Step 7: In a greased 8 x 11 pan add a layer of noodles (half of them) to the bottom of the pan. Add the meat mixture on top then add the rest of the noodles on top of the meat. Spread each layer and pat down slightly firmly. Next, add the Cream sauce that you added the eggs to on top and spread to cover. 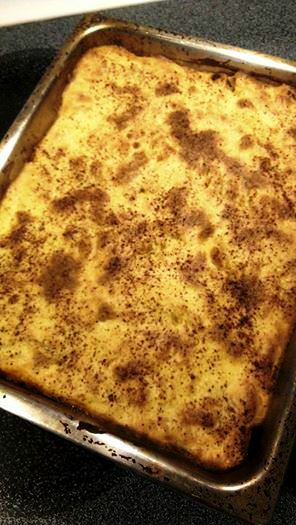 Lastly, top with nutmeg. Ahhhh, almost done!! 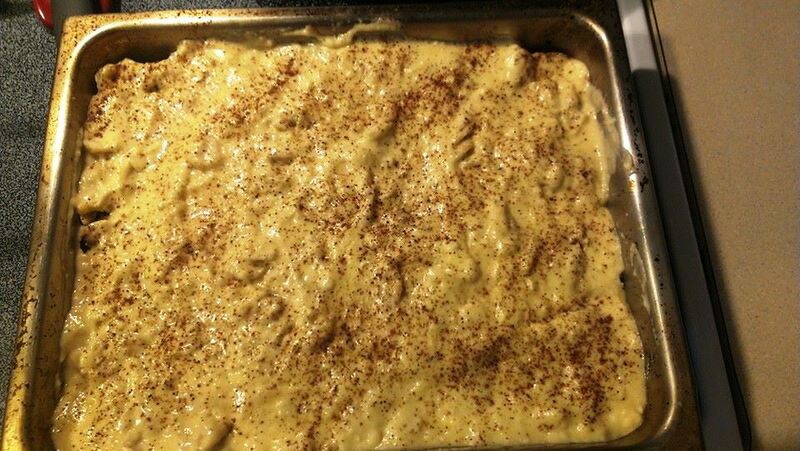 The picture above is it about to go in the oven. Cook uncovered on 350 for 40 to 45 min-check to see when it starts to brown on top and then it is done!! Let it cool and settle before cutting and serving. I hope you try this and enjoy the process! It is labor intense but worth it!!! My dad loved it and asked for seconds, everyone was happy and felt a little lighter compared to the traditional way of course! 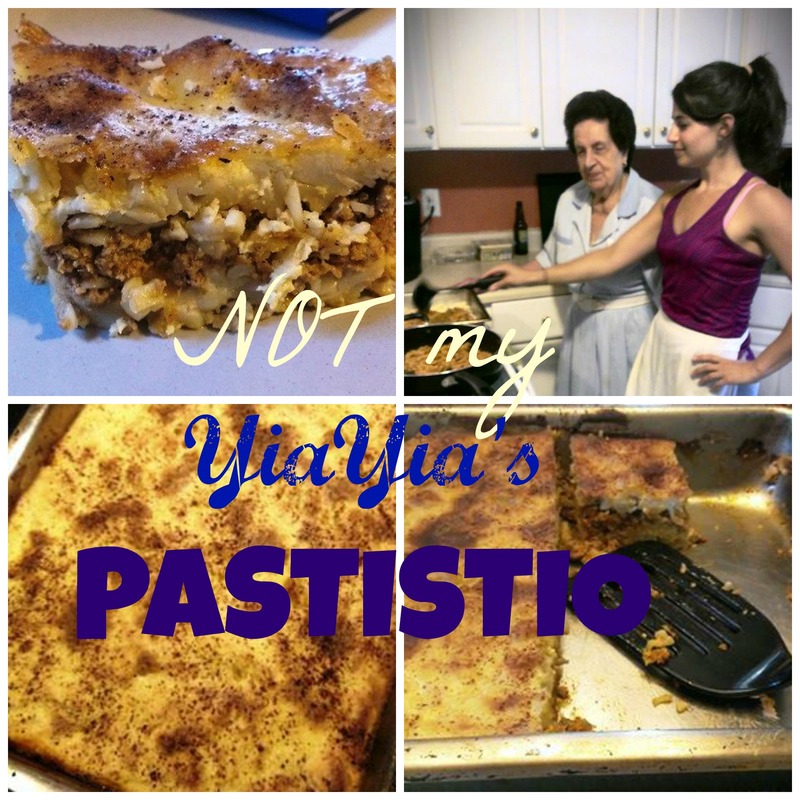 Maybe it was the fact that we didn’t also have it with YiaYia’s lamb, red potatoes, spinach pie, salad and bread too! Oh my. 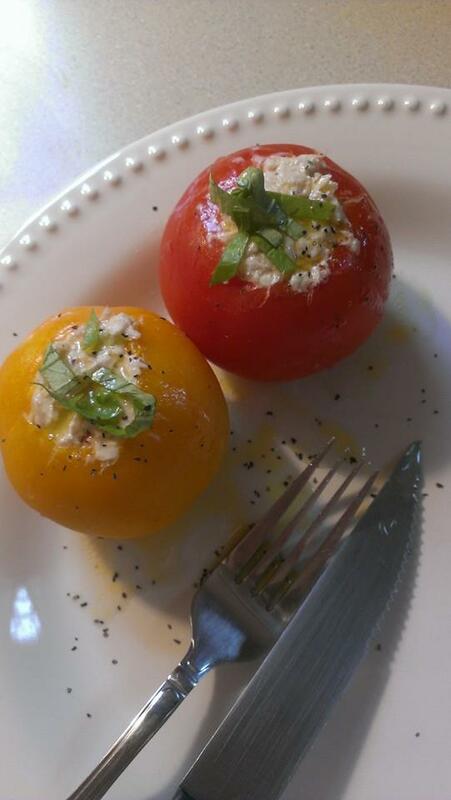 Tuna stuffed glorious summer tomatoes! Go to your local farmer’s market and pick up some of these beauties! I used 3 tsp of an asiago cheese and artichoke dip (you can use Greek yogurt or mayo-or nothing here), 2 five oz cans of white tuna, 2 tsp finely chopped of each celery & red onion. 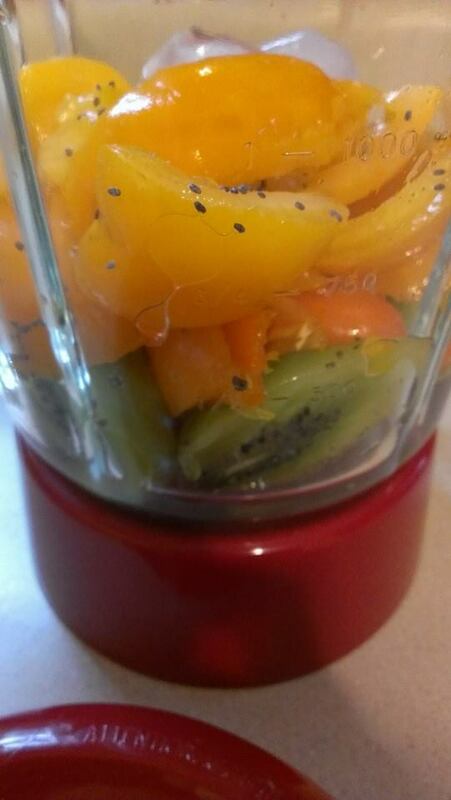 then add blk pepper, cayenne pepper & garlic powder-pinches of each! Mix together. I used a mellon baller to hollow out the tomatoes. You just want to make sure you get the wet seeds and guts out of the tomatoes before you stuff them. 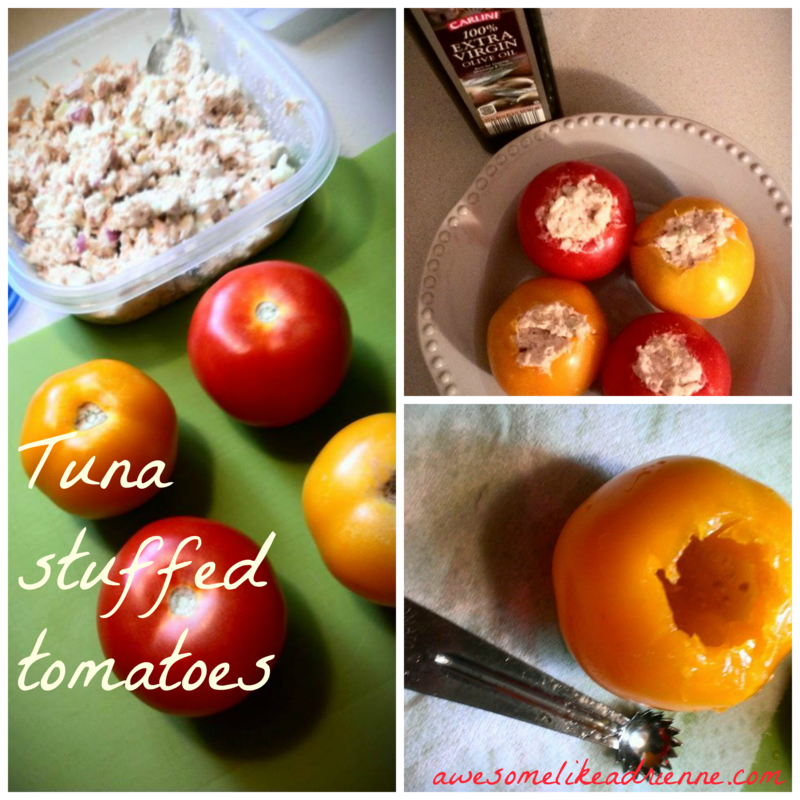 Once tomatoes are hollowed fill them with the tuna salad and then store in the fridge until ready to eat! This made 4 med tomatoes plus about a cup of left over of tuna salad for me to eat later in the week or you could make 6 to 7 total stuffed med tomatoes. When ready to serve top with evoo, lemon juice and fresh basil. I hope you enjoy this one!! We had these last night with steak on the grill. Lots of protein!!! This may make you feel amazing!!! 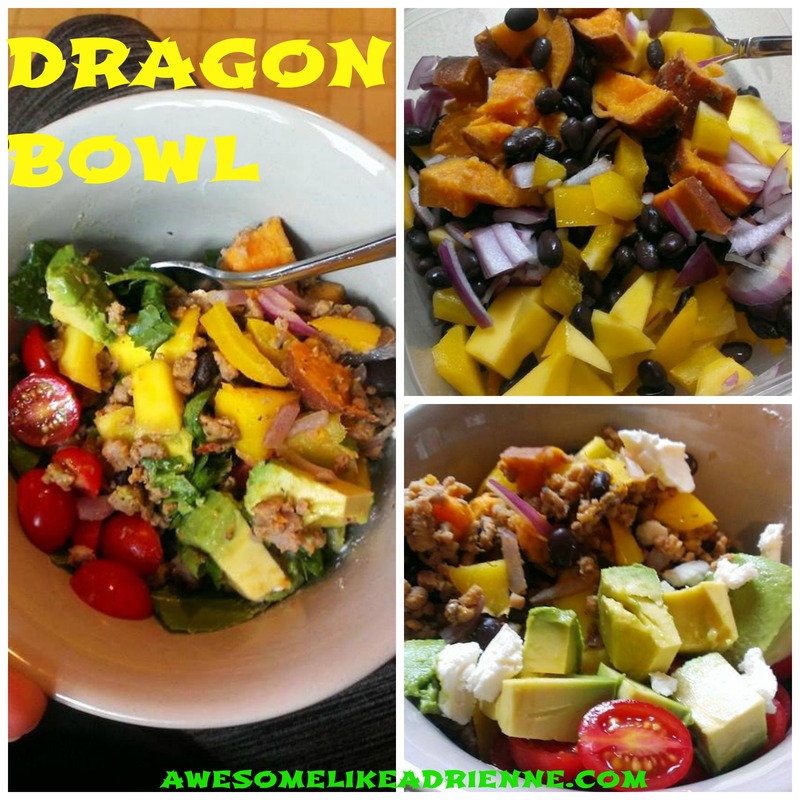 Dragon bowls are meant to take what you have on hand and create a complete balanced one bowl meal that will leave you completely satisfied!! Traditionally, they do not contain meat but I went ahead and added some!! I hope that doesn’t upset the inventor of the Dragon bowl! I mean well! 1. Cook Ground Turkey(or your choice of meat or fish) with seasonings listed above. You can also use egg to get more protein if you don’t use meat! 5. Add tomatoes, avocados and cheese, top with lime juice. Use your imagination! Use what you have on hand! Try and get as many superfoods in that bowl as you can!! You may store leftovers but just keep the warm portion separate from the cold. You want the sensation of eating the warm topped with the cool (lettuce, avocado, cheese and tomatoes in this case) When ready to eat heat the skillet mixture and then top with other ingredients. Right now I have Tupperware containers filled with (separately) mango, tomatoes, the extra black beans from the can, avocado and goat cheese. Tomorrow I will make these again using the re-heated leftovers and will top with cold ingredients right before I eat it. I will also line the bottom of my bowl with the baby lettuce mixture first. 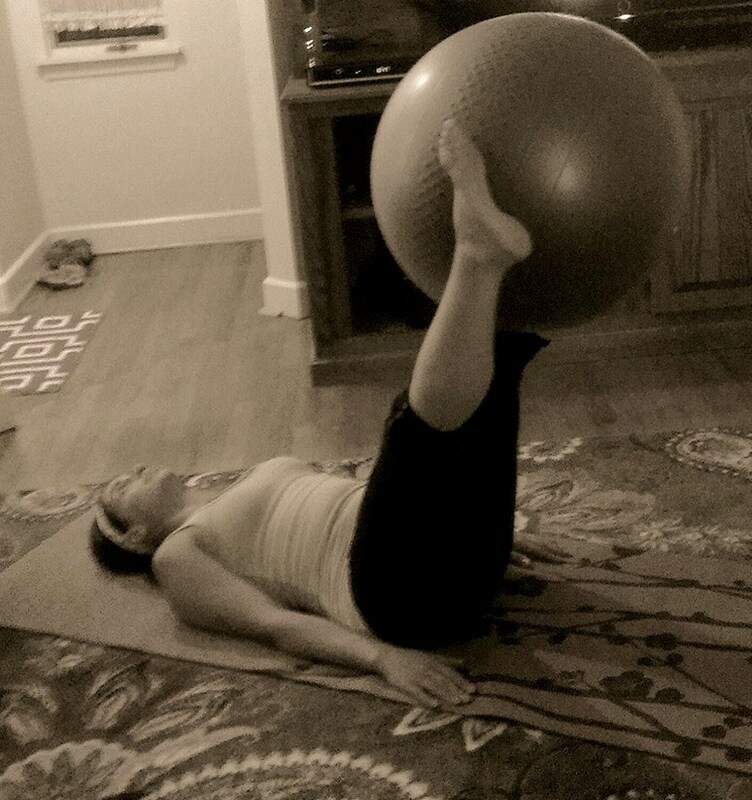 Bridge hold or pulse for 20 sec or 20 slow reps up and down pushing your heels against the ball which is against the wall/couch/etc (something stable)….also your feet could be a little higher on the ball than mine are in the picture! Mt. Climbers pictured above-push small toning ball tight into the ground and bring each leg in holding core tight and alternating legs for 20 reps at a fast pace. 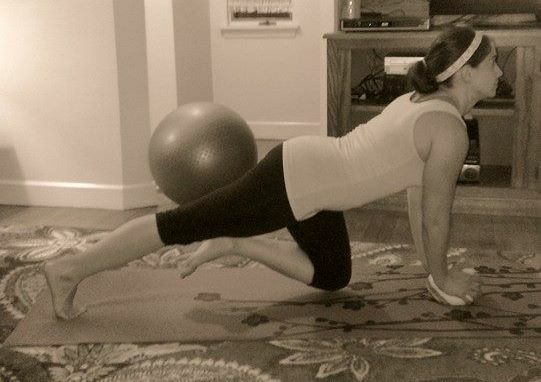 Leg lift-slowly lower your legs holding your core tight until feet and ball almost touch the ground then raise them again-repeat sequence 10 times. Now you are done with round 1! Do as many rounds as you have time for but 2 rounds in 20 minutes would be awesome! 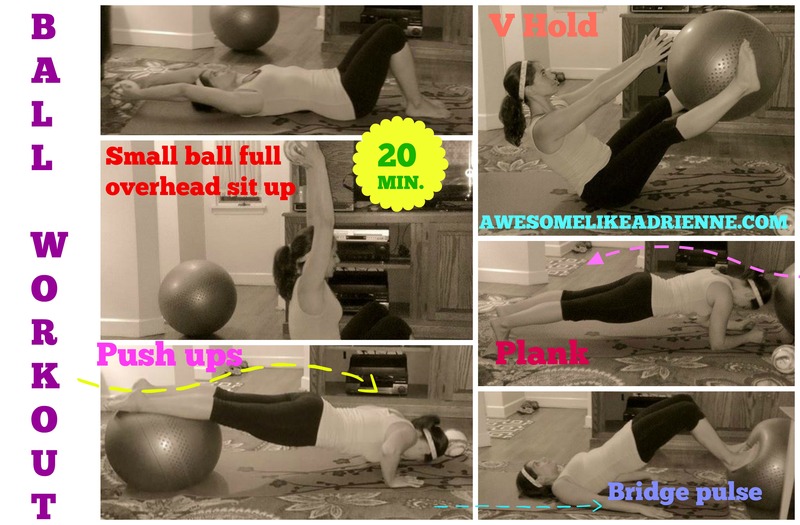 Rest about 30 to 45 seconds between each exercise!